It might sound ridiculous to try to compare Aron Baynes, an undrafted reserve with four career starts, to Bill Laimbeer, a four-time All Star and NBA champion. However, the two have more in common than you’d expect. Before Laimbeer became the ringleader for the Pistons’ Bad Boys and a namesake for a Super Nintendo videogame, he was an afterthought. Sandwiched in the draft between two players who never appeared in the NBA, Laimbeer – the 65th overall pick in 1979 – was forced to start his professional career in Italy for developmental purposes. Nearly every team has a bruiser in today’s NBA. Even as the league has veered away from the hard fouls of bully-ball, physical reserves have remained crucial in the rare moments when teams need to slow down elite big men or deliver message fouls to opposing stars. As a result, bruisers have become the NBA’s most situational and limited role player: lefty specialists of basketball, if you will. *For a frame of reference, Andrea Bargnani had more blocks in 2009-2010 than Evans has had in his entire career. That’s really bad. Still, Evans continues to make a living in the league because he’s willing to do a team’s dirty work and get rough. It might be surprising to learn that Laimbeer was only slightly more versatile than Evans for most of his career. Unlike Evans, however, Laimbeer eventually developed out of the one-dimensionality of bruising and became one of the league’s most dangerous offensive weapons. History remembers Laimbeer’s offensive versatility fondly; he was one of the league’s first stretch big men, netting more than 200 three pointers in his career. Yet, in truth, Laimbeer was incredibly limited for much of his career. He never attempted more than 21 three pointers in a season until the age of 30 and only shot above league-average from deep in three of his 14 NBA seasons. Still, because Laimbeer’s offensive game expanded at the outset of the Pistons’ first championship run, fans 25 years later remember him as a perennial floor spacer. Strength is one of the few assets that all NBA players maintain as they age. So as Laimbeer developed his offensive touch in his late 20s, he suffered no discernible regressions on defense in terms of physical presence around the rim. Look around the league today and it’s increasingly clear that Laimbeer’s game has yet to be mimicked by anyone. While stretch big men are more present than ever, very few – if any – supplement their perimeter shooting with interior defensive dependability. It’s all well and fun to daydream about Reggie Evans developing a perimeter game but reality insists that will never happen. After all, Evans’ career 52% from the free throw line suggests shooting is not a natural skill for him. That’s a large reason why Channing Frye got $32 million from Orlando this summer despite averaging just 5.1 rebounds per game as Phoenix’s primary big man last season. It’s also why Chris Bosh is still regarded as a max player from most executives around the league: Big men who stretch the floor can turn a good offense into a dynamic juggernaut. Big men who stretch the floor on offense, while also supplying dependable interior defense, create a monopoly of sorts with matchup nightmares for opponents at the big man position. Which brings us to Baynes, the 27-year-old restricted free agent from Australia. Baynes sat behind Tim Duncan, Tiago Splitter, Boris Diaw, Matt Bonner and Jeff Ayres in the championship Spurs’ rotation last season, so it’s understandable why he’s gone under the radar for so long. 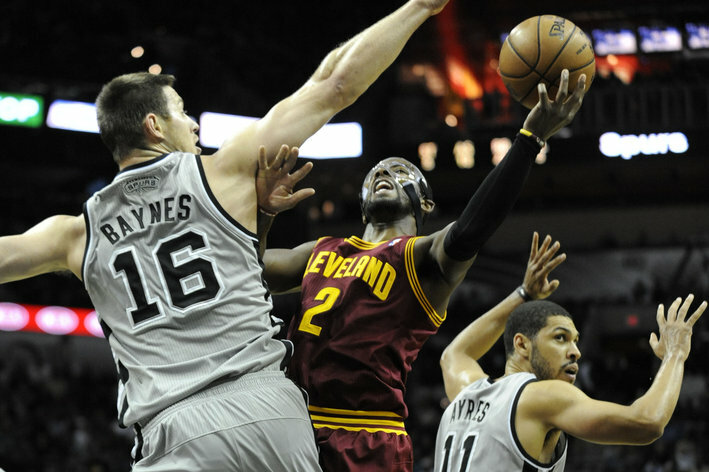 In terms of functionality for the Spurs, Baynes is asked to perform the Reggie Evans role for the team. No more, no less. Rebound effectively, commit hard fouls and agitate opponents of higher profile. In limited time over the past two seasons, Baynes has performed that role masterfully. What makes Baynes so intriguing, though, is that he can be so much more on the floor than what San Antonio asks him to be. He’s settled into a Reggie Evans-like role out of team necessity — not out of skill limitation. Most obviously, Baynes’ analytic projections indicate that he could be a double-double machine. Expanded out to 36 minutes, Baynes’ statistics from last season balloon to 11.8 points and 10.6 rebounds per game (per Basketball-Reference). Those are starter-quality numbers. But those numbers barely scratch the surface of displaying Baynes’ full potential. Baynes’ rebounding numbers are legitimately impressive, borderline elite. Over the course of the 2013-2014 regular season, Baynes ranked fourth in the entire NBA in contested rebound percentage with 49% of his boards coming in traffic (per NBA Stats). Baynes also swallowed 16.6% of all available rebounds (rebound percentage) while on the court last season, a number identical to Laimbeer’s in both of the Pistons’ championship seasons. Analytics identify Laimbeer (32nd in league history in career rebounds) as a better defensive rebounder than Baynes but conversely state that Baynes’ offensive rebounding percentage of 13.6% from last season would’ve matched Laimbeer’s very best offensive rebounding season. It’s not just the rebounding. Baynes emulates Laimbeer as an interior defensive presence as well. In the 2014 playoffs, opponents shot just 40.9% against Baynes at the rim. Mind you, the sample size is admittedly small but that’s a percentage on par with the very best rim protectors in the NBA. For the season last year, in a larger sample size, Baynes’ rim protection was on par with most NBA centers (per NBA Stats). That too may be misleading as Baynes was playing exclusively against the most skilled big men in the league, masking his effectiveness to some degree. In the playoffs Baynes averaged .49 points per touch of the ball, far and away the most efficient of any Spurs player. Of course, the clever passing from Parker, Ginobili, Diaw and company aided that number. More tellingly on offense, Baynes also showed deft touch from the center of the floor in limited time during the regular season. Eliminate the ill-advised shots from the sides of the hoop and Baynes’ midrange percentages are encouraging. Add in the fact that he shot 19-21 from the free throw line last season and it’s clear Baynes has a sound shooting touch. 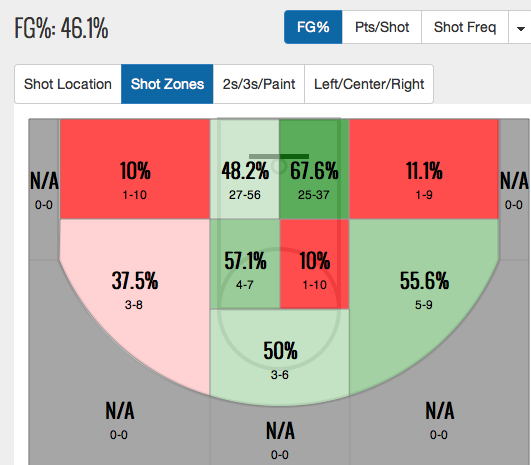 Perhaps just a willingness to shoot from midrange makes Baynes a worthwhile project. He connected on 9-of-32 midrange catch and shoot opportunities in the regular season. Sure, that’s not a spectacular percentage. But as noted earlier, Laimbeer was also lost from the perimeter (20-for-90) until his eighth season in the league. Baynes has only played parts of two NBA seasons and has still yet to hit his prime at age 27. With proper form on his shot already in place and enough confidence to keep shooting, Baynes should be able to gradually expand his game to the perimeter and become a deep-ball threat by the age of 30. You might remember, Channing Frye only started attempting and connecting on three pointers consistently after four full seasons of perimeter futility to start his career. Baynes still has plenty of time and reason to develop a perimeter shot. Baynes is currently a restricted free agent. San Antonio has extended a qualifying offer to him for less than $1 million in the hopes of retaining him. However, if a team offers him an expanded role and a contract in the range of three years for $6 million, that might prove to be too expensive for the Spurs’ to match. It’s time for teams to start taking notice of the underappreciated players Gregg Popovich and R.C. Buford like. They usually turn out pretty good.